The New York Times says it has seen a memo which shows that the US president was firmly set on the path to war two months before the 2003 Iraq invasion. From private talks between George Bush and UK PM Tony Blair, the memo makes it clear the US was determined to go to war whether or not he had UN backing. He is quoted discussing ways to provoke Saddam Hussein into a confrontation. A UK lawyer quoted the note in a book published in January but this is the first time it has been seen in full. White House spokesman Scott McClellan refused to discuss the contents of the memo but said that up until the last moment, President Bush was interested in pursuing a diplomatic solution to the Iraq issue. 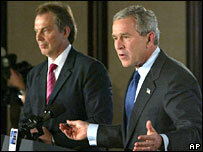 The five-page memo, dated 31 January 2003, was written by Mr Blair's then chief foreign adviser, David Manning, the New York Times says. Summarising the two-hour White House meeting, the memo says: "Our diplomatic strategy had to be arranged around the military planning." Mr Bush is paraphrased as saying: "The start date for the military campaign was now pencilled in for 10 March. This was when the bombing would begin." Although the US and UK pushed for a second UN resolution on Iraq, the memo cites Mr Bush saying he did not believe one was needed. "The US would put its full weight behind efforts to get another resolution and would twist arms and even threaten," Mr Bush is paraphrased as saying. "But he had to say that if we ultimately failed, military action would follow anyway." Mr Blair is described as responding that both countries must make clear the second resolution was "Saddam's final opportunity". According to the note, he also told Mr Bush: "If anything went wrong with the military campaign, or if Saddam increased the stakes by burning the oil wells, killing children or fomenting internal divisions within Iraq, a second resolution would give us international cover, especially with the Arabs." The UK government has always insisted military action was used as a last resort against Saddam Hussein's regime. Downing Street has stressed Mr Blair only committed UK forces to Iraq after securing the approval of the House of Commons on 18 March 2003. The memo indicates both leaders acknowledged it was possible no unconventional weapons would be found in Iraq before the invasion, the New York Times says. The note cites Mr Bush suggesting three ways in which Iraq could be provoked into confrontation. The US "was thinking of flying U2 reconnaissance aircraft with fighter cover over Iraq, painted in UN colours", Mr Bush said. He also indicated the US "might be able to bring out a defector" to talk about Saddam Hussein's weapons of mass destruction, and mentioned a proposal to assassinate the Iraqi leader. Mr Bush describes US military strategy in some detail, including a concentrated air campaign. He predicted it "was unlikely there would be internecine warfare between the different religious and ethnic groups" - an opinion with which Mr Blair agreed. Mr McClellan said he would not comment on private conversations between the two leaders but did say Mr Bush's private comments matched those he made in public. Excerpts from the memo were first quoted by UK human rights lawyer Philippe Sands in his book Lawless World.